Aubryanna Hall scores a layup during the first half vs. Lebanon. Nyla Hampton cuts inside past Lebanon defender Logan Mueller. Destiny Bohanon looks to make a pass while getting pressure from Kendall Folley. 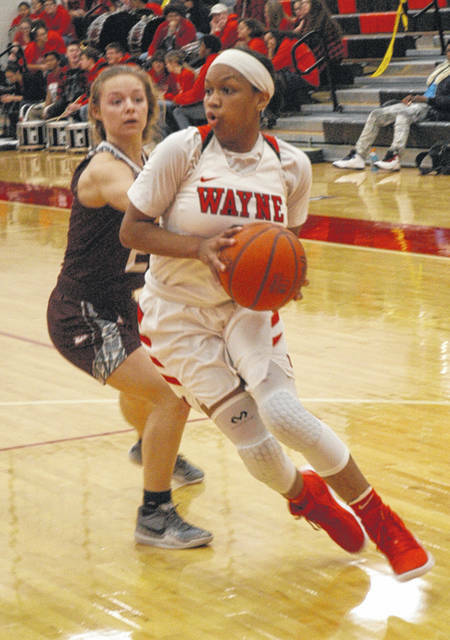 HUBER HEIGHTS — The Lady Warriors jumped out to a 12-2 lead Wednesday night against Lebanon and then missed some easy layups and shots inside to let the other Lady Warriors back into the game. Wayne led by five after the first quarter and 25-18 at halftime before putting the game away in the third quarter by building a 21 point lead en route to a 55-31 win. 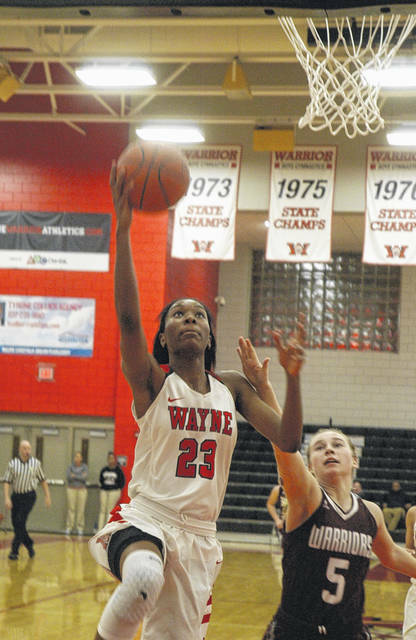 Olivia Trice knocked down a pair of 3-point field goals in the third period and Aubryanna Hall, who led Wayne with 19 points, scored seven to help Wayne build a comfortable lead. Destiny Bohanon finished with 11 points to contribute to the victory. The Lady Warriors went on a 13-0 run to open the third quarter and held Lebanon to only four points the entire period. Wayne went on an 8-0 run to open the fourth period to open up a 29 point lead. Lebanon was led by Kendall Folley with 12 points, eight of which she scored in the first half. Weather concerns prevented Wayne from competing in the Classic in the Country at Berlin High School held Sunday and Monday. One of Wayne’s scheduled opponents, Glen Oak High School, didn’t make the trip either. 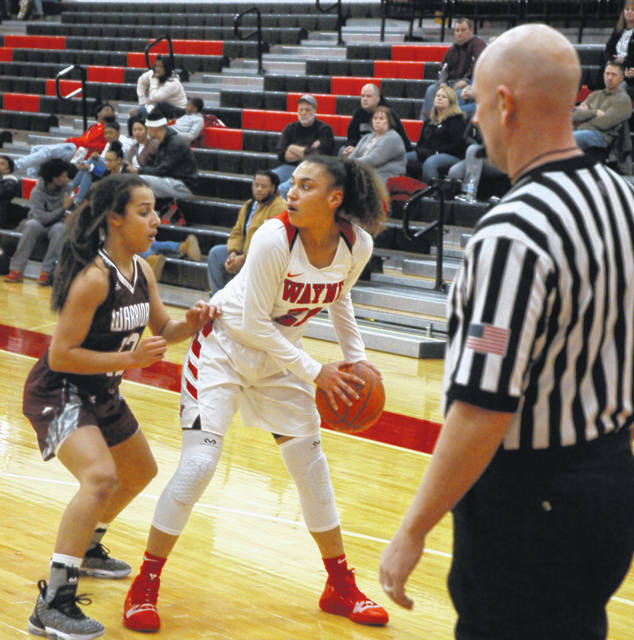 Wayne last played on Wednesday, Jan. 16 at Springboro when the Lady Warriors walked away with a relatively easy 60-33 victory. Wayne plays at Fairmont Saturday night and hosts Beavercreek on Wednesday. Lebanon: Molly Edmunds 2-0-4, Lindsey Saurland 3-1-7, Kendall Folley 6-0-13, Sid Rigsby 1-0-2, Logan Mueller 2-1-5. Totals: 14-2—31. Wayne: Nyla Hampton 3-2-9, Kyra Willis 2-2-6, Destiny Bohanon 4-1-11, Olivia Trice 2-0-6, Aubryanna Hall 8-2-19, Jaida Wolfork 1-0-2, Lovie Malone 1-0-2. Totals: 22-6-55. 3-point goals: Lebanon 1 (Folley); Wayne 5 (Trice 2, Hampton, Bohanon, Hall). Records: Lebanon 7-9 (4-4), Wayne 10-4 (6-2).